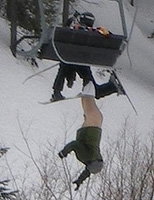 JANUARY 14--Embarrassed that one of its employees took--and then distributed--photographs of a skier dangling upside down and pantsless from a Vail ski lift, a Colorado firm is threatening legal action in a bid to suppress any further publication of the now world famous images. In a cease and desist letter e-mailed today to The Smoking Gun, SharpShooter Imaging (SSI) claims that its employee took the photos "while on duty" and that he violated the firm's "commitment to respect the privacy of all resort guests at every resort SSI represents." The company, which employs photographers to take photos of visitors at various ski resorts and other attractions, contends that it owns the copyright to photos taken by Marty Odom of the January 1 mishap on a high-speed lift in Vail's Blue Sky Basin. Odom, who initially told TSG and other news outlets that he was not working when he took about six photos of the dangling skier, has since changed his story to say that he was on the SSI clock when he stumbled across the newsworthy incident. Odom was suspended from his job after one of his photos appeared in the Vail Daily News along with a photo credit. Two of Odom's photos--along with three other images of the dangling skier--were published on January 6 by TSG, triggering stories worldwide about the bizarre Vail accident. The coverage was a black eye for the ritzy Vail ski retreat, which is operated by Vail Resorts, Inc.